Akute atherothrombotische Komplikationen tragen im Rahmen der beschleunigten Atherosklerose zur kardiovaskulären Morbidität und Mortalität diabetischer Patienten bei. Die Hemmung der Thrombozytenaggregation kann das Risiko für das Auftreten akuter atherothrombotischer Komplikationen reduzieren. Der vorliegende Artikel stellt die Behandlungsvorschläge der Österreichischen Diabetes Gesellschaft zum Einsatz von Hemmern der Thrombozytenaggregation dar. Acute thrombotic complications as a key feature of accelerated atherothrombotic disease typically precipitate cardiovascular events and therefore strongly contribute to cardiovascular morbidity and mortality in diabetic patients. Inhibition of platelet aggregation can reduce the risk for acute atherothrombosis. 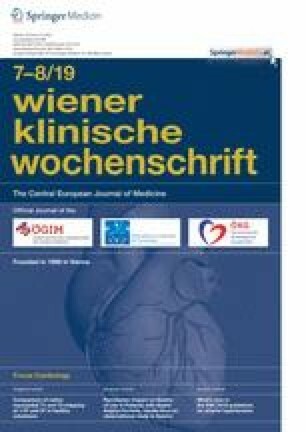 The present article represents the recommendations of the Austrian Diabetes Association for the use of antiplatelet drugs in diabetic patients according to current scientific evidence. T.C. Wascher und C.H. Saely geben an, dass kein Interessenkonflikt besteht.